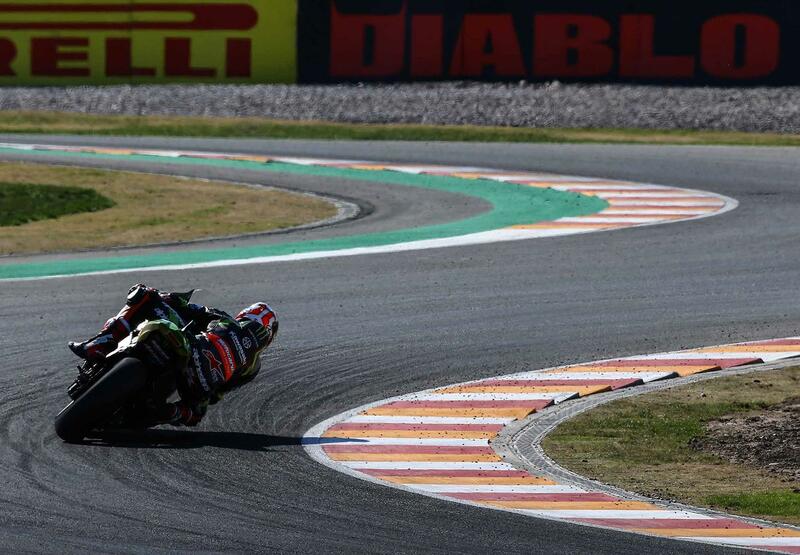 Jonathan Rea has taken his ninth win in succession with a commanding race one victory in Argentina in mixed conditions, becoming the first rider to do so at the new circuit in the process. Crossing the line 9.163 seconds ahead of Ducati pole man Marco Melandri aboard his Panigale R, Rea was able to take the lead in the early stages of the first lap on his ZX-10RR before comfortably controlling from the front despite spots of rain falling in the latter stages. 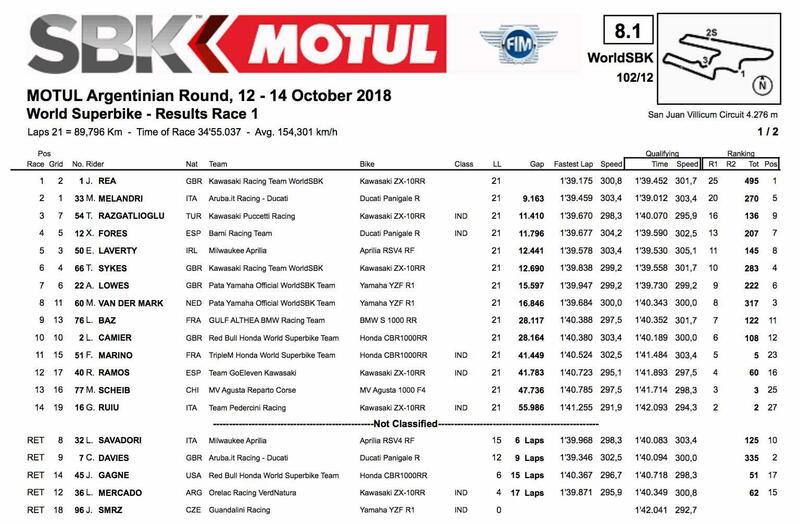 Rounding off the podium was fellow Kawasaki rider Toprak Razgatlioglu, who came from seventh on the grid on his Puccetti Racing machine to finish 11.410 seconds down on the victor. The Turkish rider showed great late race pace, mounting a charge for the podium from the halfway stage onwards during an intense battle with Eugene Laverty, Tom Sykes, Alex Lowes and Xavi Fores. This was despite Laverty’s Aprilia showing incredible straight line speed, which was able to comfortably pass Sykes and Lowes along the 1.2km back straight. Also in the mix was the second factory Ducati of Chaz Davies, however the Brit rider crashed out at turn five with nine laps remaining just as the first signs of rain began to appear in that sector. Davies was just one of many retirements in the race, with only 14 riders finishing in total. The first of these DNFs was Jakub Smrz, who didn't actually make the start after his Guandalini Racing Yamaha R1 experienced technical problems on the out lap to the grid. Other fallers consisted of home favourite Leandro Mercado and Honda Racing’s Jake Gagne. The second Milwaukee Aprilia of Lorenzo Savadori was forced to retire six laps from the end, too. Finishing behind Razgatlioglu in fourth was fellow independent rider Fores on his Barni Racing Panigale R, ahead of a gaggle of British riders consisting of Laverty, Sykes and Lowes. Leon Camier finished slightly further down the order in tenth place.